A recently filed lawsuit could herald the end for all Zorro trademarks and licenses. For the past century, Zorro has been one of the most iconic vigilantes in fiction. Created in 1919, the character has featured in multiple books, television series, comics, and films, including Antonio Banderas's popular Mask of Zorro. Zorro even laid the groundwork for the fledgling superhero comic book market, directly inspiring the development of Batman himself. Now Zorro is ready to combat one of his oldest foes once more: Copyright legislation. According to Hollywood Reporter, Zorro copyright holder Zorro Productions is being accused of filing fraudulently misleading trademarks for Zorro's likeness. If the lawsuit succeeds, it could sweep Zorro straight into the public domain, rendering all trademarks and license agreements for the character meaningless. The lawsuit was filed by one Robert Cabell who, believing the original Zorro stories to be public domain, created Z: The Musical of Zorro as a full-length stage production. After licensing the musical to be performed in Germany, Cabell was allegedly threatened with litigation from Zorro Productions owner John Gertz for not paying the appropriate license fees. Cabell responded with an actual lawsuit, intending to prove not only that Zorro belongs in the public domain, but that Gertz fraudulently obtained multiple Zorro trademarks. Zorro Productions has faced similar lawsuits in the past, but was able to settle out of court. "Defendants have fraudulently obtained federal trademark registrations for various 'Zorro' marks," the lawsuit reads, "and falsely assert those registrations to impermissibly extend intellectual property protection over material for which all copyrights have expired. Defendants also fraudulently assert that copyrights for later-published material provide defendants with exclusive rights in the elements of the 1919 story and the 1920 film." 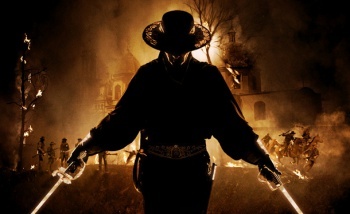 Even ignoring the fact that 20th Century Fox has a Zorro reboot planned for next year, the case has huge implications. Zorro stories have engaged audiences for almost 100 years, but Zorro Productions is quick to file against anyone using his likeness, including chocolate companies using Zorro costumes in a commercial. A public domain Zorro would finally allow anyone to produce and distribute Zorro works without fear of legal reprisal. Considering that the last significant alterations to Zorro's mythos happened in 1998, the possibilities for adapting the character are endless. Now if you'll excuse me, I think it's time to write a screenplay in which Zorro, Sherlock Holmes, and John Carter recover H.G. Wells' Time Machine from the Martians.